Are you shopping for an inexpensive kitchen scale which provides accurate readings? Consider the highly rated Weighmax Electronic Kitchen Scale. While this scale does not boast as many features as some models which cost a bit more, it is good value, and it is sufficient to fit the needs of most home cooks. Tare Function: Want to weigh food in a bowl, but don’t want the weight of the bowl included in the measurement? Use the tare function to reset the scale to zero after you set the bowl on the scale so that you can get a measurement which is restricted only to the food in the container. Auto-Off: If you do not use the scale, it shuts off automatically in around half a minute. This prevents the unit from wasting power if you get distracted or you have too much food on your hands to turn it off while you are working. Easy to Use: With just a couple of buttons and a bright, back-lit LCD screen, this scale will not throw you off with a bunch of complicated controls. You can learn how to use it within just a few minutes. This is a low-cost option. This is one of the less expensive kitchen scales I have checked out. You will save money on this device without sacrificing accuracy. The scale measures accurately. As just mentioned, you get accurate readings on this scale to within a gram. You can use it with or without the bowl. 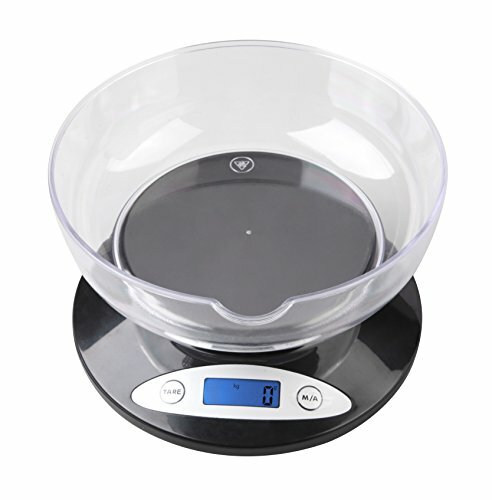 You will notice that the Weighmax Electronic Kitchen Scale comes with a plastic bowl. The scale works perfectly well with or without it. It is totally up to you if you want to use it or not. A few buyers have said the bowl cracked, possibly as a result of washing it in water which was too warm. This has no bearing on the functionality of the scale or its durability. There are not a ton of extra features. Some of the other scales which I have tested definitely offer more features (like conversions). But not everyone needs these features, and for some buyers, the cost savings are preferable to unnecessary extras. You might consider buying this scale if you want to save money on an accurate measuring device which emphasizes simplicity and ease-of-use over bells and whistles. The Weighmax Electronic Kitchen Scale is missing some features which some chefs may find useful, like unit conversions. But it does include the basic functionality you need for most measuring tasks and is affordably priced. I was pleased with the model I tested and can give it a confident recommendation. The Greater Goods Digital Kitchen Scale is a powerful low-cost scale which looks great and takes up hardly any space while doing good in the world! The Ozeri ZK14-AB Pronto Digital Kitchen Scale is a solid model that was used as part of a scientific research study by Harvard Medical School which is a testament to its accuracy. Customers seeking a precise, accurate kitchen scale which is portable, aesthetically pleasing, and includes a wide array of functions will want to think about the Etekcity Digital Kitchen Scale Multifunction Food Scale. The AccuWeight Digital Multifunction Food Scale is popular, highly rated and affordable. Its glossy design is appealing to the eye, and its functionality goes far beyond simple measurements. Learn this fantastic buttermilk biscuit recipe, inspired by my grandmother.